Okay, I can only imangine the story behind this one. Obviously some vet cut the front panel off of this stretcher bearers arm band to make it fit nicely in a scrapbook. Whether it was the actual stretcher bearer, his sweetheart, or a U.S. vet, I guess we will never know. You can see marks across all four corners left by tape. That is where I get my scrapbook theory. I have seen other such items placed in scrapbooks over the years. If you want a representation of a stretcher bearers armband, here is you chance to get one without paying $85.00. This is a Deutsche Wehrmacht armband of BeVo weave construction. Deutsche Wehrmacht basically translates into German Armed Forces or German Military. 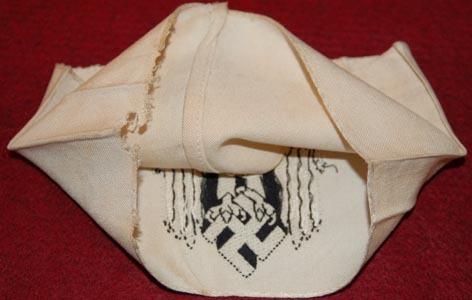 It was worn by civilians that were employed by the German Military. 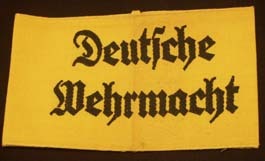 Letters are the black gothic style and woven onto a yellow armband. These are fairly minty with only a little soiling from being stored away for 60 plus years. I have a few of these, so the one pictured may not be the one you get. 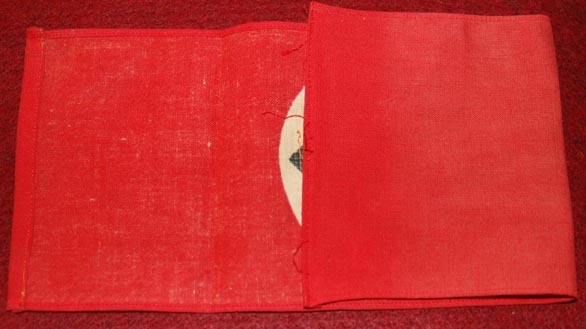 All are of similar condition to the one shown. 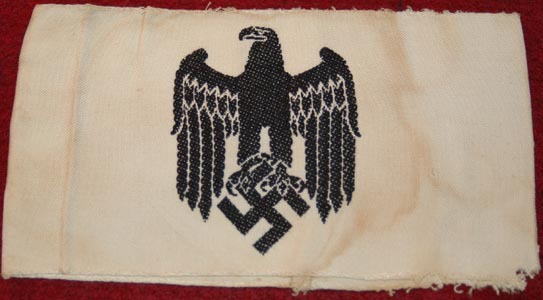 This is a nice representation of a Im Dienst der Deutschen Wehrmacht armband. It has black print on a white cotton armband. 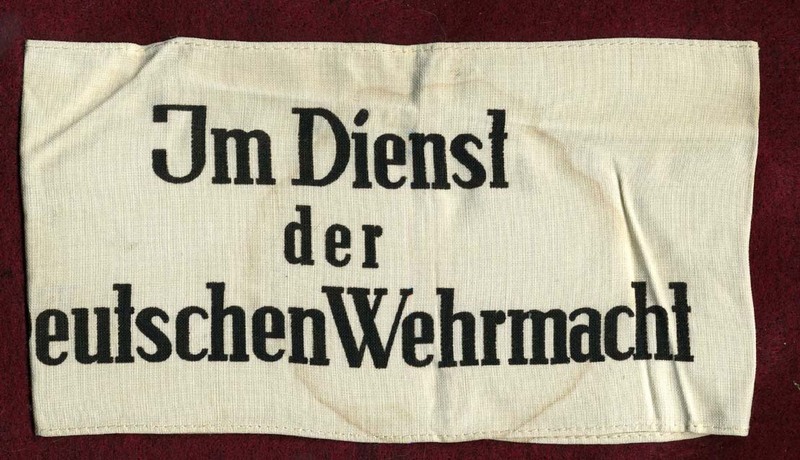 This translates into, "Im the service of the German military." 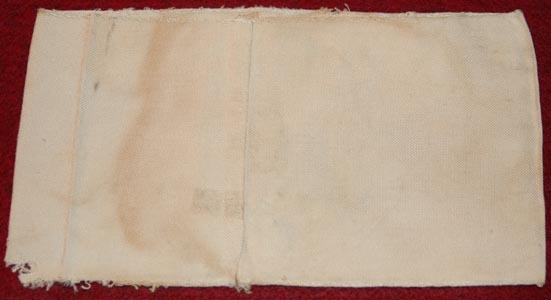 The armband sports a few wrinkles and an outline of a stain in the center. To me, this just adds character. I would rate it excellent. It will display nicely in any display. White background with black print. 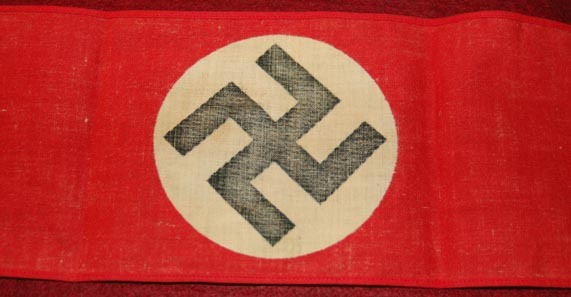 This is a Deutscher Volkssturm Wehrmacht armband. The Volkssturm was established on October 18, 1944. Its membership included any able-bodied male from age 16 to 60 that could bear arms and who were not already in military service. They were not issued uniforms, so this issued armband identified them as being in military service. This is a very nice example. The armband is in great shape and will display beautifully. It is printed like in a silk screen process. I have a few of these, so the one pictured may not be the one you get. All are in equal, if not better shape than the one pictured. A great piece of history. While not pristine and pure white any longer, this is a great armband! I would say that it was never worn. It has just picked up stains from storage over the years. 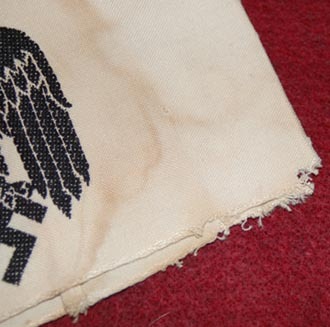 The front has a stain line to the right of the eagle. 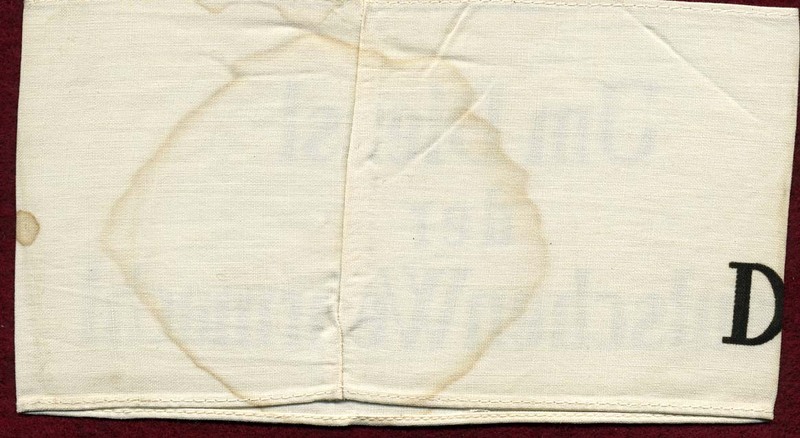 This same stain line can been seen on the reverse. There is also a faint hinting of the a small label on the reverse. The top center and lower right corner looks like it may have been nibbled on by a moth at one point in time. It is not bad and you should be able to see it in the photos. I like this piece as it has character! Heck, I hope I fare that well at 60+ years old. It was worn by military personnel acting as stewards during military parades. I have also heard/read that recruiters used them. I have found no pictorial or hard evidence to support or reject either suggested use. If someone out there has or knows of a photo or period documentation, please let me know. The eagle is woven onto the armband. It looks impressive if you turn the armband inside out! This one will display well. The ends are sewn together. 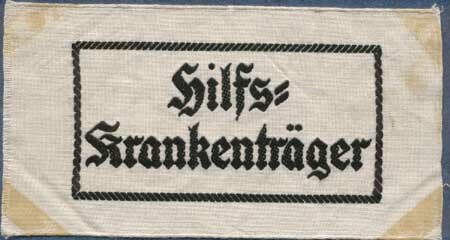 This is an excellent cotton NSDAP armband in near mint condition. It is the printed variety. The ends appear to have been sewn together at one time, but they are unsewn at present. Aside from the white fabric in the center disc being a bit dingy with age, it would almost look like it was a brand new piece. That is what 60+ years will do to things. I think you would be hard pressed to find a better one!